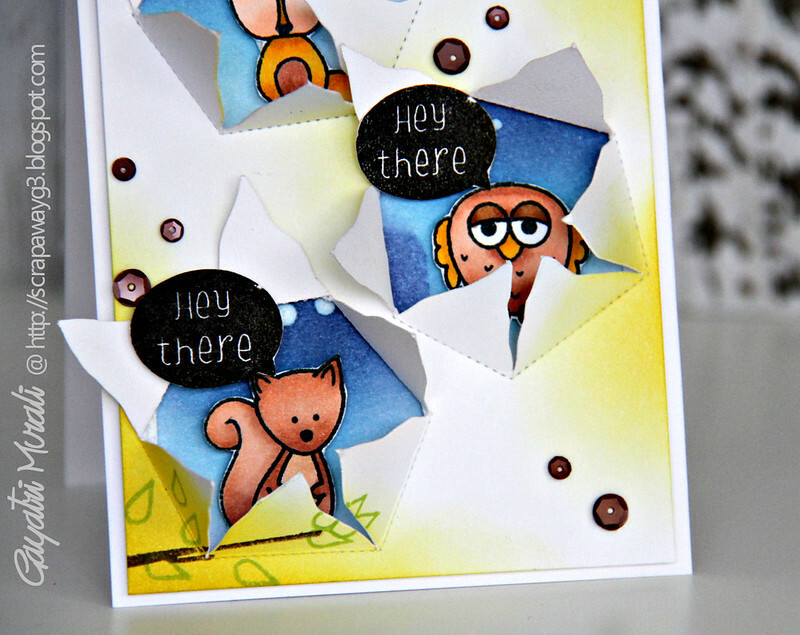 Today’s card is for Create a Smile March Guest Designer Call. I have a few goodies from Create a Smile – stamps, stencils and some chipboard pieces. I haven’t had a chance to play with them. So I took this opportunity to ink the stamp set and enter the guest designer contest. This is my card for the contest. I have used images from Friends from the Woods stamp set from Create a Smile. I stamped and copic coloured them then cut them out. On the panel, I have die cut three Peek a Boo from Peek a Boo die from Pretty Pink Posh. I then sponged shades of blue distress ink under the diecut area on the card base. Then spattered some white ink. On the die cut panel, I sponged some yellow distress inks then stamped the branch and leaves. I mounted this panel on the cardbase, opened the Peek a Boo petals and foam mounted the images. Then stamped the sentiment three time with black ink and cut them out and foam mounted then as well. Finally accented with some Espresso 6mm and 4mm sequins from Pretty Pink Posh. Here are couple of closeups. If you like to participate in the guest designer call, HERE is the ink. See you soon with Winnie & Walter’s release card. Great card! I love those colors, and the idea with the peek-a-boo frames is amazing. 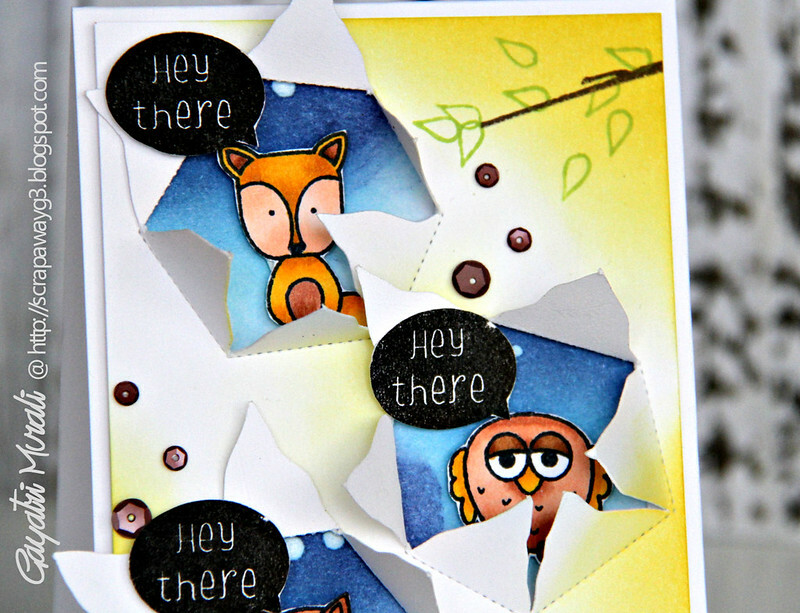 What a fun card with the animals peeking out from the openings. fun surprise to. Great card as always and love the peeking idea. Thank you for joining our guest designer call over at create a smile. I love this card! I saw the peek-a-boo die but had no idea how I would use it…now I have a few 🙂 I found this post through Amy's throwback Thursdays on the PPP blog!